This is going to start off sounding like a riddle. The book shelves are actually one of my pride and joys. 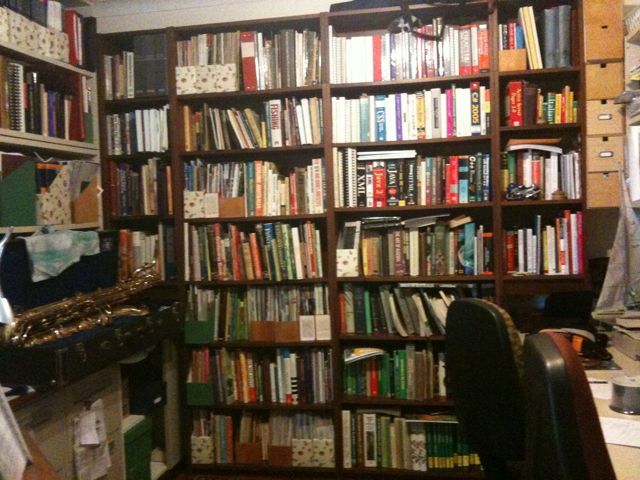 We lived with a muddle of shorter units piled on top of each other that were repurposed from another house but I always dreamed of floor to ceiling wall to wall shelving in our study. The benches on either side came first and we have some other shelves on the two other walls that were salvaged from an office refit. Because it would have to be made to measure it was going to be too expensive to get it custom made and too big a job for hubby to do. So we did without. Then one day I had an epiphany. With some careful measuring and some compromises we made these from various units from Ikea. The compromises were some gaps around the base where the corners meet the benches. But it was great when I realized that some CD drawers nicely filled one of the side gaps at the top. What’s the messy bit? Well these books all started off being arranged by subject. They are our non fiction books that have survived several moves. A couple are texts that I have had since uni. When I had finished arranging them there were none that were lying flat or sideways but hubby doesn’t replace them so well and I gave up fixing them. This entry was posted on	June 27, 2010 at 10:53 am	and is filed under Home. I have to admit to quite a smile when I read this! My partner and I have just made the life changing decision to finally move in together and he comes to my house with LOTS of books. Lots and lots and lots of books. To add to my already quite considerable collection. 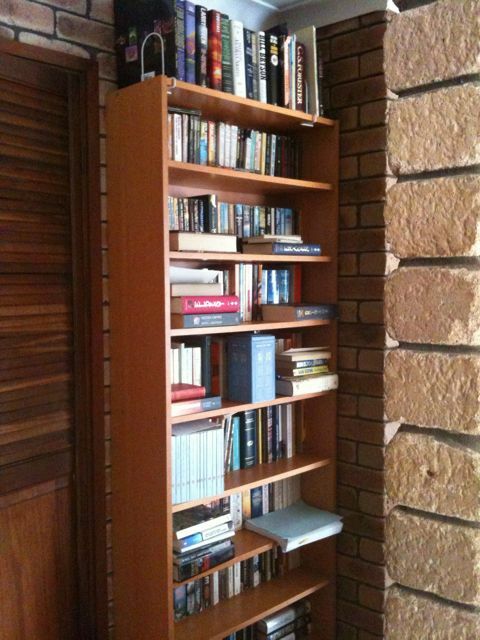 To more than double the number of books in my already book-crowded lounge and hallway. He also brings a drum kit, 4 guitars a lute-like thang and LOTS of CD’s… but that’s a story for another time. Librarian p0rn! A whole study full of it!